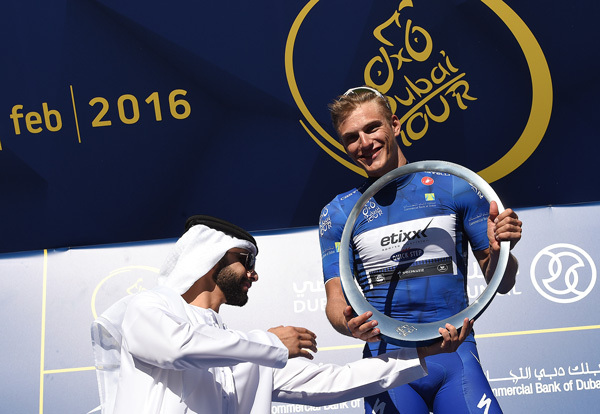 Almost as if he wanted me to expand on my half-baked ramble from earlier in the week, Marcel Kittel again beat Mark Cavendish in a sprint finish at the Tour of Dubai. The win also means he won the race as a whole, which tells you pretty much all you need to know about how challenging the Tour of Dubai is. An interesting fact from Inrng is that Cavendish has never beaten Kittel when they’ve both contested a sprint. This is of course a fact of two halves. The obvious half (the half that’s facing you perhaps) is that Kittel’s the faster sprinter. The less obvious half that’s concealed behind that is that Kittel doesn’t always get himself into a position to go for the win. Quite often he’s some way behind, puffing and panting put up a hill, hair gel coursing into his eyes due to the torrents of sweat. Cavendish has in fact won eight races in which Kittel has been taking part – it’s just the German was dropped way before the finish. It’s a classic example of that trite and annoying phrase ‘you’ve got to be in it to win it’. Despite this, it’s advantage Kittel in the head-to-head. He’s won 15 times when Cavendish has also been in the field. Perhaps more significantly for the season ahead, he’s done it twice this week.